I care deeply about making each client's event uniquely special, and work closely with them to create a musical program customized to their tastes and needs. With 20 years of experience providing special music for events, I have extensive experience performing for wedding ceremonies, receptions, cocktail parties, religious services, and funerals. 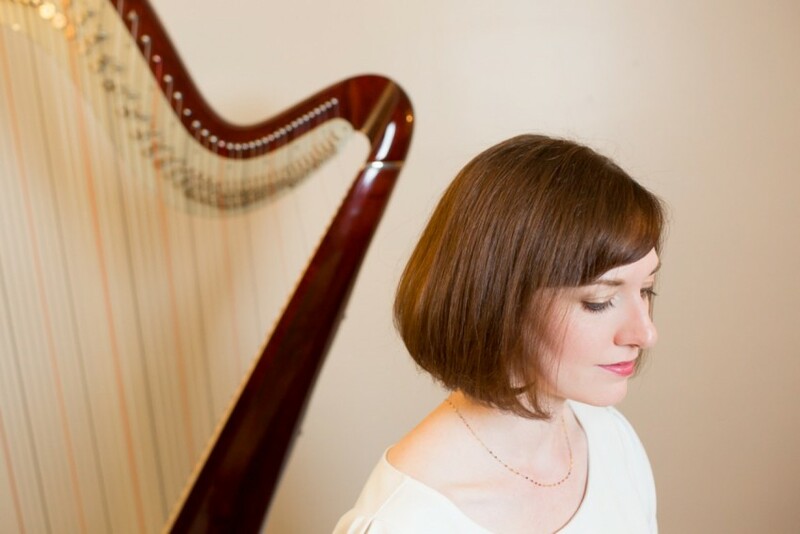 As a professional harpist, I also teach privately and at the university level, and perform as an orchestral musician, soloist, and chamber musician in a variety of concert settings. Colleen helped to make my mother's memorial service that much more special. She was prompt, professional, kind, and she played beautifully. I am so very thankful. Dear John, It was a pleasure to provide music for her and your family. Your mother's service was beautiful! Colleen did an ABSOLUTELY AMAZING job at our wedding! Not only did she play BEAUTIFULLY, but she also arranged a song that we requested for the wedding (in advance), and she even played softly in the background during our family portrait session. Her presence definitely added class, elegance and sophistication to our special day, and we are so grateful we found her! Thank you, Sharonda! You and Perry were an A+ bride and groom team, thorough in your planning and a pleasure to work with. I had so much fun playing music at your beautiful wedding ceremony! Congratulations, and all my best wishes and prayers to you both as you begin your lives together. Ms. Thorburn was amazing. She was very patient during, before and after the wedding. The music was very delightful and Ms. Thorburn was exquisite as well. She is a must to make any occasion elegant. Thanks, Shay! Your wedding was lovely down to every last detail. I'm glad I could help add to the elegance of what I know was a very special day for you and your friends and family! My very best wishes to you and your husband as you begin your marriage. 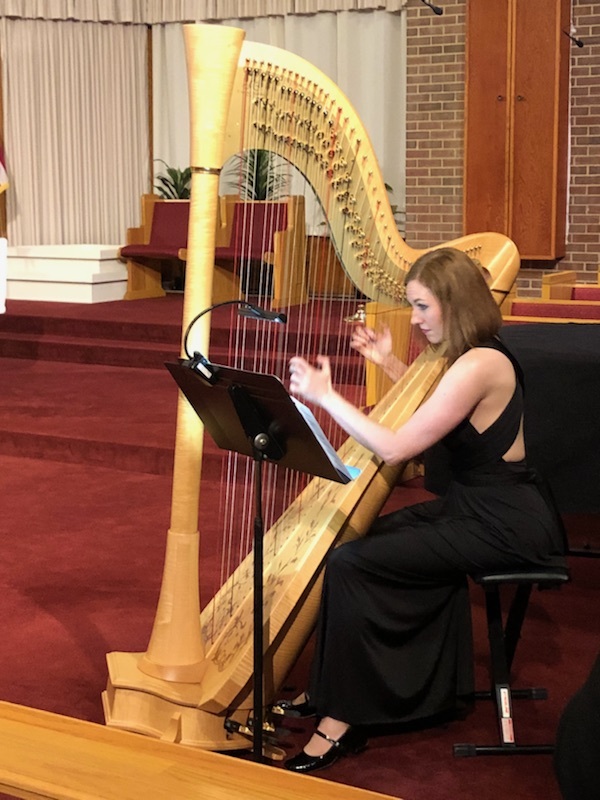 My clients for weddings and special events can expect the highest degree of professionalism and a personable disposition, in addition to high-quality, expertly-performed harp music that will make their event truly special. Clients are guaranteed prompt and friendly communication with me by phone, email or Skype, with the possibility of a face-to-face consultation for clients desiring to visit my home studio in Petersburg. I work with clients as far in advance of their event as possible to consider their musical requests, locate and learn new repertoire, send sound samples, and/or suggest musical selections--all with the goal of creating a customized musical program according to the client's needs. For weddings, I draw from my professional experience to advise clients on appropriate places in the ceremony for music and typical duration, number, and types of musical selections. The day of the event, I arrive at least a half-hour before I need to begin playing so I can tune, set up, and check in with the venue or event planner. I have never been late to an event! 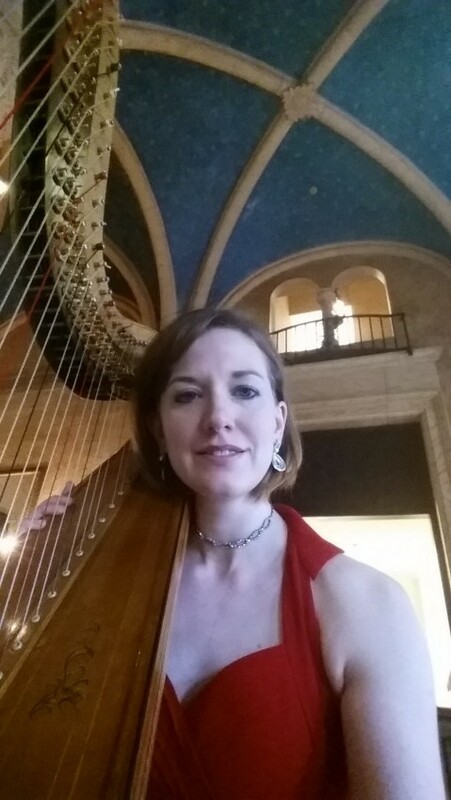 Colleen is a professional harpist who has been providing high-quality live harp music for concerts and special events for 20 years. She plays regularly for wedding ceremonies, cocktail hours, wedding receptions and parties, and corporate and special events. 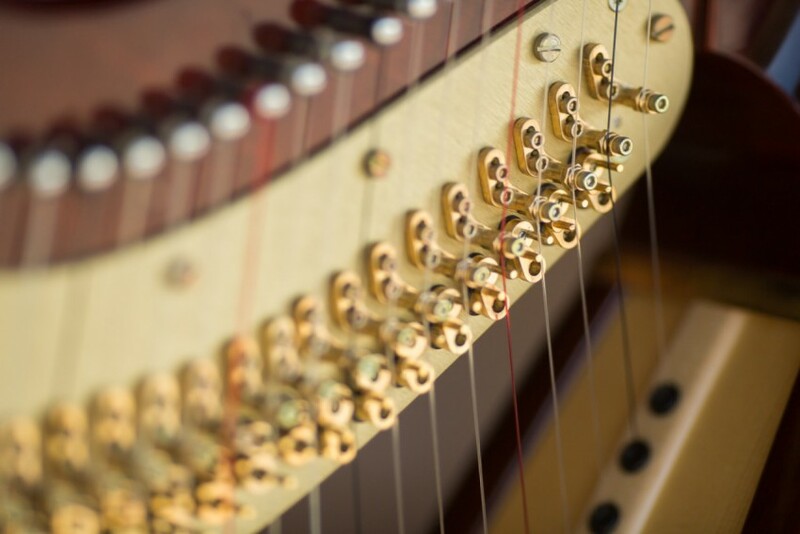 Colleen offers her clients a broad repertoire base, ranging from wedding standards like Canon in D to popular songs and show-stopping virtuoso harp masterpieces. She is comfortable making musical recommendations for a variety of musical tastes and happily accommodates her clients' musical requests. A nationally-recognized soloist, Colleen has been a featured touring artist with the Virginia Commission for the Arts. She has performed in diverse settings with celebrated artists, ranging from the Yale Philharmonia in Carnegie Hall, the Philadelphia Orchestra in the Kimmel Center, and the Aspen Chamber Symphony with Joshua Bell at the Aspen Music Festival, to playing back-up harp for Kanye West's Chicago-area shows. 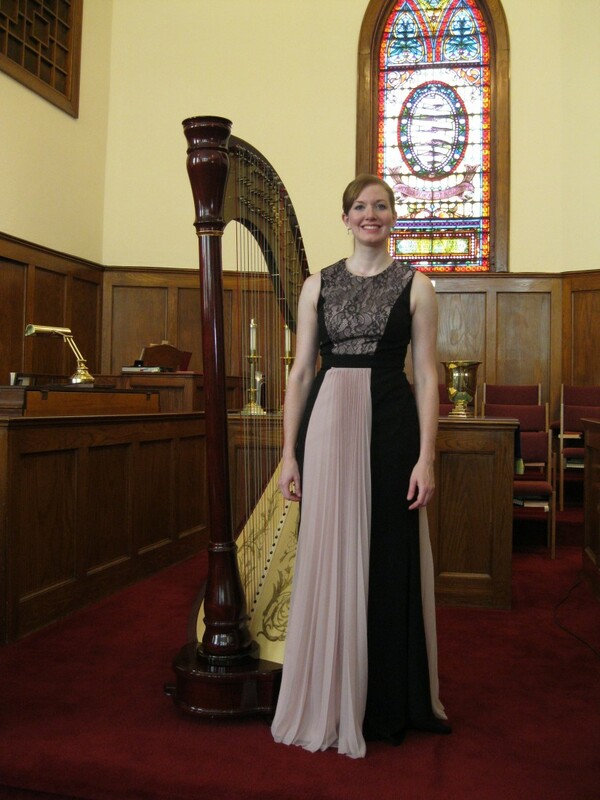 She performs regularly as an orchestral musician with the Richmond Symphony Orchestra and teaches harp in the greater Richmond area and at Virginia Commonwealth University. I travel with my harp, bench, and music stand -- those are usually all that is needed to put on an event featuring the harp! My pedal harp is acoustic and projects excellently in most indoor spaces with no additional amplification necessary. Clients are welcome to provide their own amplification if they believe it is necessary. -Ideal conditions for outdoor performance are in 60 to 80 degrees (F) weather with 40 to 60% humidity. -The harp must be provided a dry, level surface or platform with enough shade so that the harp is not in direct sunlight. -An additional outdoor deposit may be requested to guarantee against damage. -All clients are advised to have a backup, indoor plan in the event of inclement weather.